One of the toughest challenges for people living in IDP (Internally Displaced Persons) camps is finding new ways of making a living having fled their homes with next to nothing. Ways they previously supported themselves, most often through farming are often closed for them. Families need to rebuild and re-establish their lives. Asli is a 55 year old widow and mother of seven whose arm is incapacitated. 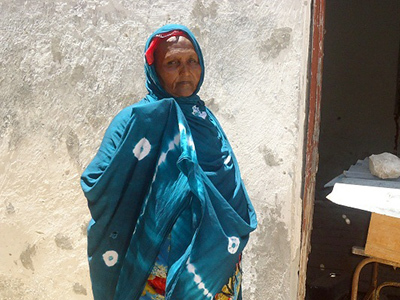 Asli was one of the beneficiaries of an AET programme providing literacy and numeracy classes to Somali IDP camps. Asli is now able to read, write and calculate. Upon completion of the literacy course, AET provided Asli with a modern wooden bee hive to help further her income generating activities. She has made excellent use of the bees and training she received. As well as selling honey produced from her ten hives in the nearby market, Asli has built up another business selling home-made biscuits, cakes and bread. The profits from these ventures have allowed her three younger children to go to school. Asli’s older children help with the family businesses, which now also include a training programme for other local people to learn about bee keeping. Learn more about our work in Somalia and supporting education for displaced communities. The ongoing conflict in South Sudan has had an enormous impact on girls’ ability to access education. In communities where a girl is more likely to die in childbirth than finish primary school, girls are in desperate need of someone to advocate for their right to education. Daborah is part of our School Mothers project for a primary school near Bor, the site of some of the most intense fighting in the South Sudanese conflict. Despite never completing education herself and being a mother to eight children, Daborah works to ensure the 56 girls in her community get the chance to stay in school and complete their education. The girl was determined to marry, but Daborah was equally determined that it didn’t have to mean the end of her schooling. She met with the girl and her husband to explain the benefits of being educated. After Daborah’s intervention, the husband agreed to allow the girl to continue with school. The girl is now about to complete her education thanks to the efforts of the School Mother. The need for mentorship and support in South Sudan is huge. Daborah says that a number of girls from other schools want to join hers because of the support the School Mother offers. Daborah feels that School Mothers are a pillar for girls’ education and should be provided in every school. 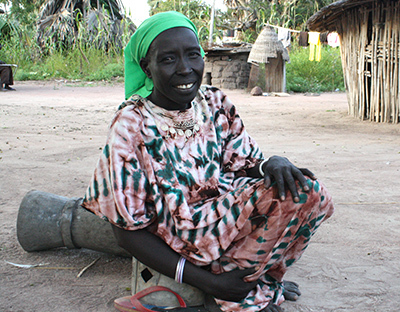 Help us fulfil Daborah’s dream of having a School Mother in every South Sudanese school. 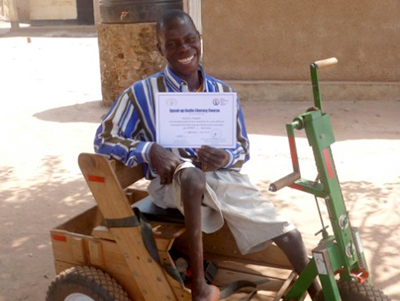 When it comes to accessing education, people living with disabilities not only face stigma and discrimination but also an education system often ill-equipped to accommodate their needs. Not least of these challenges is the fact that many people living with disabilites have no way to travel to schools, libraries or other education facilities. Our mobile libraries help bring education to people living with disabilites. 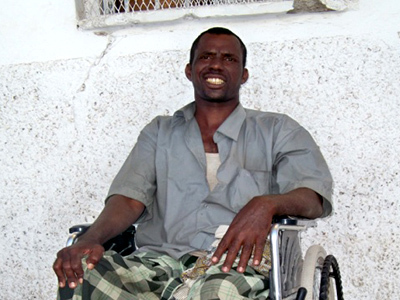 Kadar lives in a small village and is one the beneficiaries of AET’s mobile library for disabled people in Somaliland. “As a reader at the disability mobile library I am able to read new books. Sitting with my friends, I am able to read every Monday. The mobile library has created relationships that were formed reading together. These are short times but have the capability to last for a lifetime and, at the end of the day, this will bring our community closer. Learn more about our work providing opportunities for literacy and learning to people living with disabilites. Having missed out on years of education during displacement, many returnees to South Sudan came home to find the national language had changed from Arabic to English. With little to no grasp of this new official language, large numbers of people were left totally unemployable. “Wahoo! Bravo! Here I am, Robert once a man who couldn’t imagine ever smiling again after missing years of education due to the unfortunate situation I went through. Now, my life has a new beginning and is now open to great success thanks to AET and the Speak-Up Radio English literacy classes. “I was a disadvantaged youth, born of a peasant farmer in Yambio, Southern Sudan. When I was about seven years, I fell ill and became paralysed. Making matters worse, in 1990, as the SPLA forces captured Yambio, my parents and I had to escape for refuge to Democratic Republic of Congo. “Luckily in 2005, we were repatriated back to my home town. So, I began to think about how I could help myself. I started making local furniture to sell and earn a living. I realised that if I got an education I could earn more income. I needed to find ways to make my dreams come true. I knew that to get employed, the only way forward was through education, so even though life was tough and difficult to manage, I was determined to learn. “I started looking for educational opportunities but none I found were going to provide me with the skills I needed to get the good job I desired. About two years later, I heard about the AET Speak-Up Radio English Literacy classes for people like me who had little or no access to English language education. Learn more about our radio literacy programme and how it can help provide education for many who missed out on the opportunity. The small elderly population of South Sudan have lived through almost constant civil war since 1962. As a result, the adult literacy rate is one of the lowest in the world. This is massively impacting on employment opportunities and preventing this new country from overcoming its violent past. Rose was born with paralysed legs. Because she was born disabled, and therefore unlikely to be worth a large dowry, her father actually let her go to school. Rose reached year 6 (out of 8) of primary school when she was forced to leave because of the outbreak of war. Primary school was taught in Arabic, and during the war Rose took it upon herself to teach the children whilst they were hiding in the bush. Over the course of the conflict eight of her nine children died. Mary, her youngest, was the only one to survive and is currently finishing primary school. After the war, when Rose returned to her town, she was too old to go back into school to learn English which was now South Sudan’s official language. Rose joined AET’s English Language Radio project. “During the war, I missed my education, so I have been trying hard to improve my English. I like the radio training, because I am finally learning to speak English, I’m able to support my daughter in her education and am able to talk to more people in Rumbek.” She listens to the English Language Radio broadcasts in her home on Tuesday and Thursday afternoons with Mary, and joins the class once a week. It’s never too late to learn. 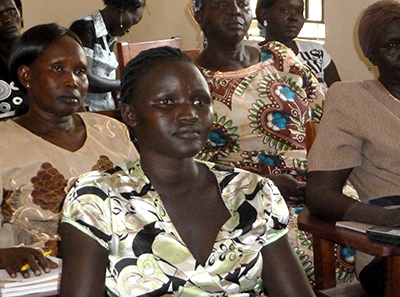 Help us provide adult education to those denied it by war. Patriarchal traditions combined with extreme poverty make accessing education an uphill task for girls in South Sudan. Early marriage is a major obstacle, as girls are often kept at home to fetch a higher bridal price. While it is vital to respect cultural tradition, the importance of educating girls and women cannot be overstated. Tabitha was born in 1992. She enrolled in primary school in 2005 and continued successfully up to 2011. She did not enrol in secondary school when her studies were interrupted due to her marriage. “I was not forced to marry but I willingly chose it. This was because there was no one supporting me to study,” she reported. Each of the learners in the Women’s Learning Centre overcomes their own set of challenges to be able to finish secondary school. Tabitha explains, “Being a mother, I am faced with challenges of household chores. I also lack good means of transport to facilitate my movement from home to school”. To learn effectively, Tabitha is determined to make it work. “I study at night after finishing my domestic duties” she added. This dedication and planning has helped Tabitha to be the best in her class based on the first term exams. Tabitha said that she advises fellow South Sudanese women who are affected by similar situations to use this opportunity provided by AET to develop their capabilities. Concerning her future career, Tabitha wants to become an accountant. “I would be very happy with any support to shape me in this field,” she commented. Learn more about our project supporting secondary school for women.